Emulate3D develops industrial engineering software designed to help engineers make better automated system designs, and save time and money at commissioning. Emulate3D software is used from the sales process, through functional design and dimensioning, through to FAT testing and commissioning, as well as virtual operator training. Within the packaging industry it is used for end of line packaging system design, machine design, fulfillment center design, and production line design. We have exhibited at PackExpo since 2007 and so we meet many of our existing users as well as new prospects at the show. It's a great place to catch up and learn about our users' evolving requirements, and we get to see all the new technical developments in the market that our users might want to incorporate in the models they build with our products. This year at PackExpo we'll be demonstrating two new offerings from Emulate3D - the first of which is Emulate3D for Machine Builders, designed to accelerate the workflow of machine designers who want to design, optimize, and test their solutions virtually, before cutting metal. Emulate3D for Machine Builders brings together within a virtual environment the "two truths" of all automation systems - the mechanical truth (that's the CAD model), and the logical truth (that's the control system), before it becomes costly to modify either. Users mark up their machine designs within their CAD environment, using a company-specific add-in ribbon which enables them to specify which parts are load creators, conveyors, sensors, pushers, turners, or any kind of mechanism they need to make their design work. This marked-up CAD model is then exported to Emulate3D where the model control elements are linked to the control IO in the PLC that will be used to run the real machine. Users can then run the virtual commissioning model to debug and verify the control system, and make changes if necessary. Being able to carry out prototyping and controls verification within a virtual environment before cutting metal clearly accelerates the design process and reduces costs significantly. 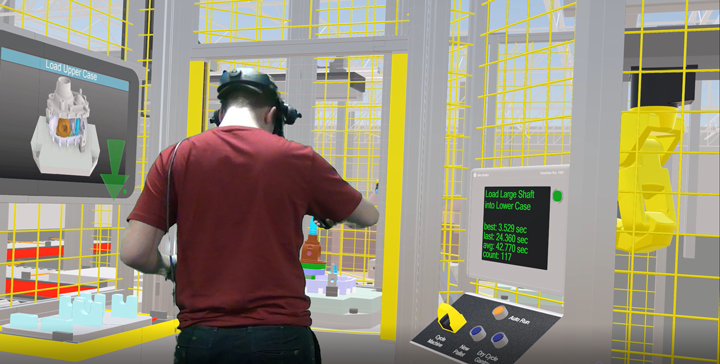 The second technology we'll be showcasing at PackExpo is Virtual Training, which enables users to train users in the operation of bottleneck machines or systems without disrupting production, and in complete safety. Training users in the operation of complex machinery can be a real challenge - the machines should be in production as much as possible, and creating faults for training purposes may be risky or dangerous. Emulate3D dynamic digital twins can safely reproduce realistic responses to control inputs, and can be used to train operators comprehensively while the real systems continue to produce. Operators within a virtual environment can operate machinery through web-based HMIs or custom interfaces, machine safety systems can be faithfully reproduced, and recovery procedures from faults can be fully incorporated. Users' performance can be tracked, and they can be guided to repeat exercises until a required standard is met. Virtual training can be autonomous, with models including video instruction as well as a variety of visual and audible prompts. PackExpo attendees will be able to experience interactive virtual training models for system operation, maintenance, and repair at the Emulate3D booth. Within a virtual reality environment and using two hand-held controllers, attendees will be instructed on the correct sequence necessary to carry out a particular semi-automated packaging operation. They will be able to pick up and place virtual products, activate controls, open controls cabinets, remove panels, replace components, be detected by safety systems such as light curtains, and start and stop instruction videos to provide them with support. I look forward to walking the show on the lookout for new machines and systems our users may well want to incorporate into the models they build with Emulate3D software, but I'm also personally interested in advances on show at the Reusable Packaging Pavilion. Apart from being the right thing to do, it's also where much new innovation will be on show as the demand for better solutions drives creative thought. In the unlikely event that I get spare time, I'll try to drop by The Innovation Stage for similar reasons - hearing new ideas can be inspirational. We are seeing many of our users becoming increasingly interested in new technology and the opportunities that IIoT and the intelligent use of big data might bring them. They sense that competition for their products and services is only ever going to increase, and that they need to be using the best of the new technology to improve their methods and increase their market share and profitability. However, adopting any new technology is a huge leap of faith unless you have a reliable means to fully understand the impact it'll have on your company. Using Emulate3D technology to create dynamic digital twins of your systems and facilities and connecting them to the new technology under consideration gives you a numerical and repeatable means of evaluating its impact. Run your historical data through the models and see if performance improves in the new system, compared to what really happened. Evaluate, understand, and improve the application of new technology using Emulate3D's dynamic digital twins before you implement it in your real facilities. Mitigate the risks associated with your IIoT investments, and be sure you are taking the right decisions before you invest. The outlook for manufacturers is bright if they can harness the opportunities represented by the growing field of IIoT and the technologies surrounding and supporting it. Separating reality from hype is always a challenge - identifying what's useful and beneficial rather than just what's cool and "now" is essential to investing wisely in new technology. Central to this is adopting an approach based on numerical justification through testing, evaluating, and simulating. Decision making should be more of a science than an art, and choices should be made based on repeatable experimentation. Packaging continues to respond to consumer demands for a more efficient use of recyclable materials, and this will continue to drive innovative machine designs.